This month over at Sara Scraps' Rediscover Your Stash Facebook group the product focus of the month is...letter stickers. They're another one of those products that you can use in vast quantities and yet the stash remains undiminished. Except Thickers where the very pack you want is always missing a critical vowel or T, S etc. Sara threw down a challenge to post a project using all the letter stickers while she and Khristina Sorge were away co-hosting a retreat. A crafty retreat is exactly what I need need, but since I'm inconveniently located on the wrong side of the world, making amidst feeding hungry boys is the best I can do. 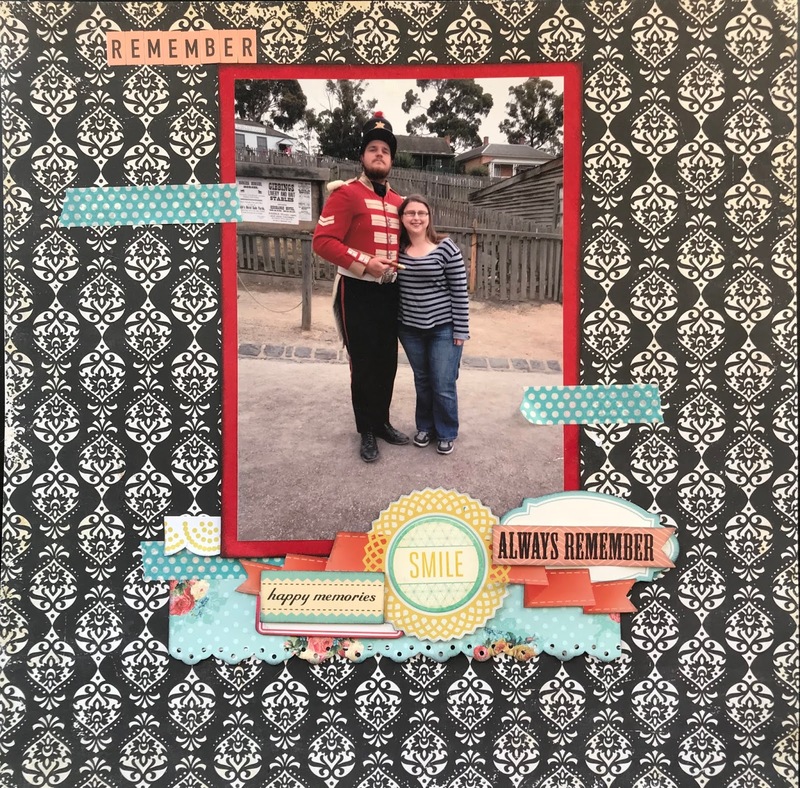 The layout I made that used the most letter stickers was one I made last year for a Paige Evans challenge and while it's basically done, I still want to add a few finishing touches. Definitely cheating to upcycle it for this! I'll post it in due course - (probably when I binge scrap all the other partially started Paige Evans challenges). 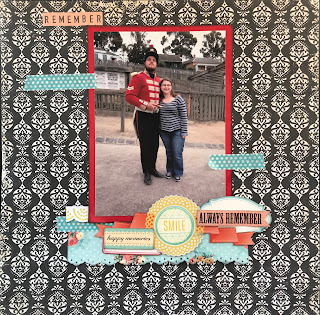 The other possibility is a rudimentary layout that originally began for a 2014 class by Shimelle called Return to the Collection. I have a whole lot of partly finished layouts for a small holiday we took at about the same time. We rarely get away so despite being a short getaway and not far from home, it was a memory worth recording and in its own album since we crammed a lot into those few days. We had a two day pass to Sovereign Hill and as a Janeite (yes it's an actual thing) I got a bit excited when I saw this guy leading his troops through the park before giving a rather lengthy speech about his conquests against the Russians (much my my amusement and NPCH's* consternation). Shimelle also used a 5x7 photo, but in the landscape view and I wanted the lines from the novel to serve as a kind of long title or journaling. I applied most of it before peeling it off and throwing the layout back unfinished and pulled apart before it was even half done. I just couldn't get it to work. Five years later I was determined to get it done and I'm pleased to say I have, although with a LOT more of the page covered than the original prompt and my expectation required, but I'm reasonably pleased. The passage of time allowed me to come up with new directions and adding supplies to the original ones I pulled out to use in the album. I added a few extra layers of paper - in particular paper with a notebook, text or bookish feel. Even a strip of stickers on the My Mind's Eye sticker sheet I had been using looked like a row of pages so I shared it around the areas of embellishment. The quote required smaller stickers and to be positioned next to the photo to get the proportions right (although taking up more page space than I initially hoped). I even managed to fit in a title and little bit of journaling. For any given layout in a "themed" album, no page requires a lot fortunately! And here's the finished page - the first finished page in the album! What an interesting time you had and a wonderful page to remember it. Thank you so much! It was a lovely few days!